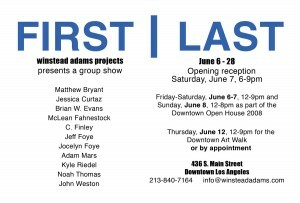 Winstead Adams Projects presents FIRST | LAST, a group show of Los Angeles area artists working in a variety of media, including installation, sculpture, video, drawing and painting. This exhibition presents work that demonstrates the dynamism and quality makes Los Angeles and Southern California a major center of artistic activity. This is the ﬁrst and last exhibition that Winstead Adams Projects will present at 436 S. Main. Following the close of the exhibit, the space will be converted into Raw Materials, an art and architectural supplies store in the heart of Gallery Row in downtown Los Angeles. This entry was posted on Thursday, May 29th, 2008 at 6:11 pm	and is filed under Exhibitions.